A last-minute vertical of Chave’s iconic Hermitage was a great and unexpected way to celebrate Vinous’s first birthday. If there is any region I could spend more time on, it is the northern Rhône. Needless to say, I was thrilled when a dear friend invited me to this fabulous dinner. Michael White’s Ristorante Morini is a welcome addition to the scene in New York’s Upper East Side, a neighborhood that isn’t exactly a hotbed of culinary excitement. I wish Morini had been around during the five years I lived right around the corner. 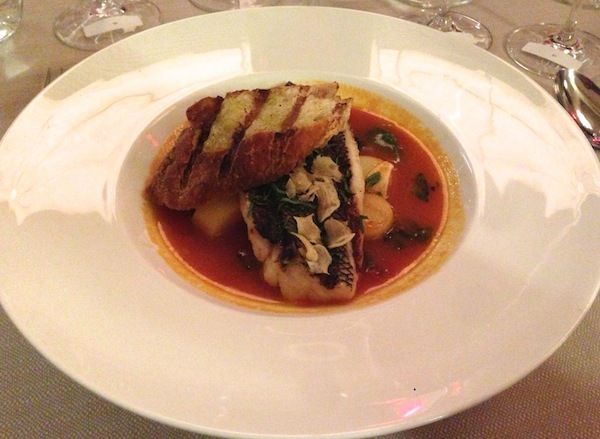 The cuisine is classic Michael White, with heavy focus on fish, seafood and deep, soulful pastas. Our dinner is delicious and beautifully prepared. It’s hard to pick a highlight, as everything is terrific. Dinner starts with the 1996 Dom Pérignon Oenothèque, a Champagne that is beginning to drink well only now, several years after its release. The razor sharp acidity and minerality are fully integrated with fruit that is beginning to enter its second plateau of development. 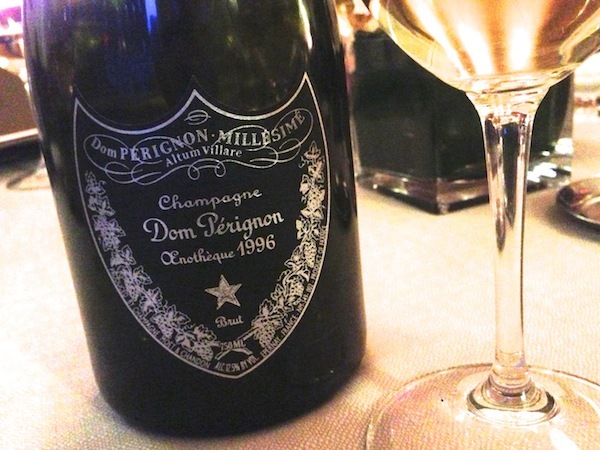 In a perfect world, Dom Pérignon would be releasing the 1996 today, as it is only recently that the wine has begun to shine. The 2002 Salon is equally majestic, but obviously much more of an infant. This is a vintage built on pure density rather than the laser-like focus of other epic years, the 1996 in particular. On this night, both Champagnes are simply stunning. Sadly, the 1978 Hermitage is corked, something that is more obvious with the passage of time. What a shame. 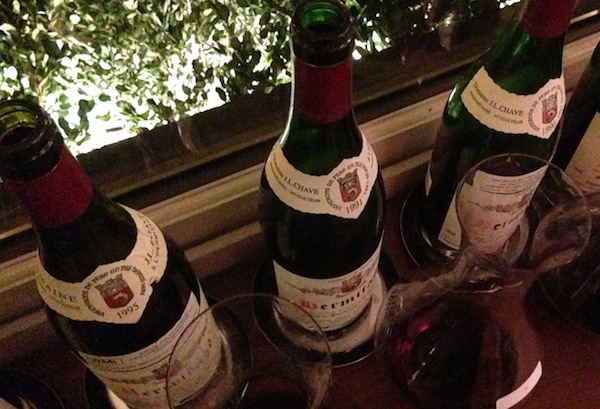 The 1999 Hermitage is huge, with a deep, enveloping core of dark red and black fruit, smoke, tobacco and cured meats. Wild overtones run through the finish. Today the 1999 does not appear to be an especially refined Hermitage, but at the same time, I would be tempted to cellar bottles for a few years, as the density of the fruit is almost overpowering, especially next to some of the more polished wines that follow. The 1995 Hermitage, on the other hand, is totally sublime. Rose petal, black pepper, dried flowers and sage are some of the many Syrah-inflected aromas that blossom in the glass in a perfumed, sensual wine that captivates all of the senses. With just six people at the table, there is plenty of wine to go around. This is a superb showing. Another gorgeous wine, the 1990 Hermitage is terrific. Huge and explosive on the palate, yet also translucent and impeccably polished, the 1990 is all about balance. Hints of cedar and tobacco develop over time, but the 1990 still needs time in bottle for its full range of tertiary flavors to blossom. Readers who own the 1990 are in for a real treat. The same is true of the 1991 Hermitage. A few months ago, I had a bottle of the Cuvée Cathelin, one of my favorite wines on the planet, so I was curious to check in on the Hermitage. Here it is the wine’s suppleness and silkiness that are utterly captivating. Expressive floral notes linger on the open, caressing finish. What a gorgeous wine this is. Both the 1990 and 1991 ease the pain of a corked 1989 Hermitage, the last disappointment of an otherwise magnificent evening. The last wine is served blind. I know I am out of my depth here. Whatever this is, I don’t have a reference point. The fruit is sweet, dense and textured. To me, it is a thirty year-old wine aged in American oak. That’s as close as I can get. It would have taken me quite some time to get to Australian Shiraz, which I have very little familiarity with. Although tough to taste after all the Chaves, the 1984 Penfolds Grange is a very good wine that is peaking but that also shows no sign of fading. Manhattan’s Upper East Side has many attractions, including a number of fabulous galleries, museums, shops, and, of course, Central Park. Now it also has a terrific new Italian restaurant in Ristorante Morini. Compared to White’s other flagship restaurants Marea and Ai Fiori, the ship doesn’t seem to run quite as tight at Morini, but those are the kind of refinements that take time.